Zone of Urgency. Quick art for quick development. Visiting the Zone Of Urgency (Z.O.U.) section of the Arsenale at the 50th Venice Biennale curated by the Chinese artist Hou Hanru, leaves you within a suspended rhythm. Something like a military syncopated march seems to guide you through the whole section, leading you towards a very critical meditation on contemporary global society. If the message to be communicated was that outlined in the title, i.e. the urgency of the world situation where global powers are aimed to certain zones providing every sort of urgencies, the task is fulfilled in the exhibition: but still something seems to be missing here. This year the People’s Republic of China has entered the Venice Biennale also with an establishment for a National Pavillion: for the first time there is a Chinese national section at the Biennale: an important event that finally reunites to the international community a great part of the world art production. Of course the Chinese contemporary rush to urbanization and global development seems to put her in fist place within the cultural and artistic debate, and this is partially true. We cannot put aside though a necessary critical distance from this “global” approach to contemporary art. More about this later. Let’s get back to the Z.O.U. 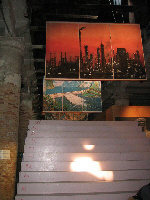 now, displayed in another location, the corderie dell’arsenale, is set up as a thematic exhibition, differently from the National Pavillion, does not have a national character. Cities and people: multidisciplinary art. More than 40 artists have been invited by Hou Hanru to participate in this section which ends up being one of the most crowded of the whole exhibition. Surprisingly not all the artist invited are Asiatic: so a certain global approach to art is underlined by Hanru giving the section a widely open character. I cannot give account of all the contributions due to lack of editorial space, so I will try to take into evidence the most meaningful works, in my opinion, before I can attempt to outline a critical approach. The first event we see entering the Z.O.U. section is the video installation “Let’s puff” by Yang Zhenzhong, two video screens on the opposite sides of the entrance show a woman breathing air out (puffing) and a Chinese urban scene in motion that accelerates synchronously with the woman’s breath. Besides the interesting experiment of interaction between human action and city scene, while we pass through these video fauces we receive a quite eloquent message: “hurry up”! It is a very simple device to introduce the Z.O.U. by outlining it’s major theme and designing a separated time within the exhibition, this art is a fast one! Most of the section has been designed by Yung Ho Chang’s Atelier Feichang Jiangzhou (unconventional architecture), and it is divided into two different levels connected by a wooden ramp. As we pass by the first level, Gu Dexin’s computer animations represented on a line of laptops, remind us the eloquence of simple figures. A clear oxymoron: simple figures, expensive machines to show them -.The oxygen room by Surasi Kusolwong, where 95% pure oxygen is provided to visitors, puts you at the centre of the artistic situation, and starts a discussion between visitors trying to figure out how to breathe the oxygen. Tsang Chou-Choy, a graffiti artist aged 82, has been writing Chinese characters on public installations in Hong Kong, the pictures of his work takes us back to a traditional analog approach to the city, underlying here a strong contrast in time and style with most of the other works. As we reach the second level “Re:Looking” by Whong Hoy Chong explores the link between fact and fiction by showing three believable information sources, a video documentary, a website and the reconstruction of a contemporary living room in Malaysia, another critical comparison between digital an analog. 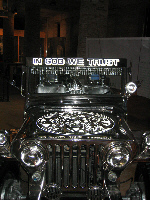 Alfredo and Isabel Aquilizan “Project M201:’In God We trust’” is a metallic a jeep displaying “In God We Trust” as a device to question the traditional archeology of collective signs. 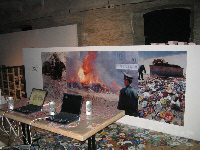 Shu Lea Cheang “Burn, shows a panel with photographs of the Burning of tons of pirate CD and DVD done by the Chinese Government in 2001 on the eve of entering WTO. 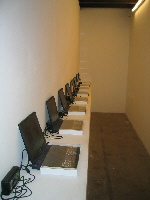 Several laptops are on display with a program to Burn your own CD adopting file sharing and choosing from different sources. It is a subtle situation to live within, once again being part of the artistic installation. The video installation “Various ways of antiterrorism” by Sheng Shaoxiong is a chess board in the middle of a room with skyscrapers and airplanes as chesspieces, the video shows several animated Asiatic tall buildings avoiding plane impacts by bending, dividing in two. The critical message to the U.S. war to terrorism is quite clear. This art is speaking to the people! Somehow Z.O.U. focuses in a critical way some of the contemporary trends that “transform the city into divided zones of war, where urgency is at the core of all activities” (Hou Hanru 2003) This urgency in somehow visualized by artists at different levels, using different paths and techniques, acting altogether as a critical keyword of the interpretation of the contemporary world. All of the artpieces, explore individually and collectively different media and are linked with one clear trait d’union. Urgency! The traditional curator role seems to acknowledge here a certain philosophical message. Hanru is showing with great elegance a wide panorama of the contemporary socially engaged art. His radical and critical approach puts successfully in evidence several examples of “different modernities” (Hou Hanru 2003) showing a successfully how to develop, using the artistic event, the cultural debate. His are indeed “alternative strategies of resistance” (Hou Hanru 2003). The Z.O.U. stands alone within the Arsenale Section of the Venice Biennale, as an eloquent example of how art can still talk directly to the people without any hermeneutic device. Now the point here is: are we ready to deal with Chinese contemporary art? Are we ready to accept non western parameters in the contemporary art production? The Chinese entry this year is so vigorous and generous to prospect a great development in the future. Something is missing throughout the entire exhibition anyway: the slow lyrism that connotes the highest artistic production, the power to stop the Urgency somehow using art at his highest level. We are listening to a chorus of coherent voices all shouting out for the same urgency, but using as media the same Urgent device, the Personal Computer. Maybe just one contribution gives a slow answer, an anti digital one: the urban painter Tsang Chou-Choy that covers the blank public surfaces of Hong Kong with lines of Chinese poetry. Hou Hanru, Zone of urgency, in La Biennale di Venezia. 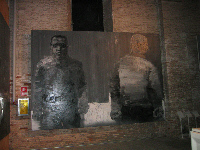 Dreams and conflicts, the dictatorship of the viewer, 50th international art exhibition, Marsilio, Venice, 2003.